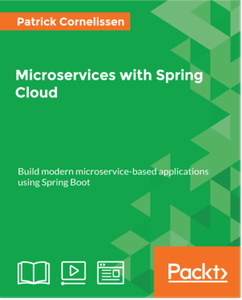 Microservices with Spring Cloud [Integrated Course]|ABC素材网|百度云网盘|下载|破解|uploaded|nitroflare|Crack,注册,KeyGen - Powered by Discuz! In this course, you will learn how to split an existing application into smaller services and what you need to build, deploy, and run it. You will learn how you can use Docker to support your local development and how you can utilize it to run your application in the cloud. To work with multiple services, you will need (for example) service discovery and reverse proxies. To be able to maintain the development pace, you also need to break up your user interface, so every service can serve its own UI, and you need to learn how to communicate with these services synchronously using REST and asynchronously using events. To run your application, you need to know what is going on in your distributed application, so monitoring and tracing calls is an important topic as well, and one that you'll learn about. So overall, this course will give you valuable insights and recipes with which to create your own distributed application, for deployment to the cloud.